Row for Results The Stamina X AMRAP (As Many Reps As Possible) Rower is built to withstand intense workouts day after day. Fuel Your Intensity The AMRAP Rower was designed for results. Dynamic air resistance adapts to your workout speed. Pull harder for more resistance; ease off for less. Further customize your workout by using the adjustable damper. Track your gains over time with the workout monitor and chest strap heart rate transmitter. The monitor allows varied workouts each session, increasing your motivation and interest. You can pick interval intensity programs or set target values for distance, time or calories. During your session, the monitor displays distance and interval, time, total strokes/strokes per minute, meters per stroke, watts, calories and heart rate (by using the heart rate transmitter). A game mode adds even more fun and variability. Also, a cell phone bracket allows use of your own device during your workout. Built to Last The molded seat promotes proper rowing form. Adjustable footplates with straps keep you secure. The textured grip on the rowing handle keeps your grip secure, even when sweating. 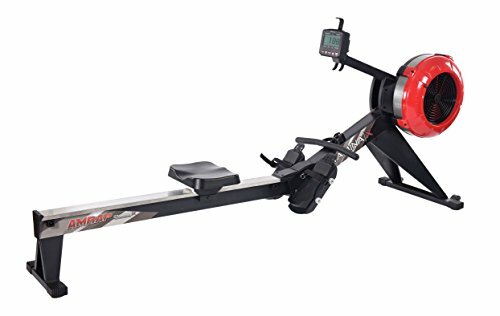 Solid-steel construction and a durable rowing chain make the AMRAP Rower a long-lasting mainstay in your home gym. Endcaps stabilize the rower and protect your floor. Built-in wheels make for easy storage after you've finished your workout, and quick separation of the main frame and rail minimizes required storage space. For a high-quality, built-to-last rowing machine, look no further than the Stamina X AMRAP Rowing Machine. If you have any questions about this product by Stamina | X, contact us by completing and submitting the form below. If you are looking for a specif part number, please include it with your message.